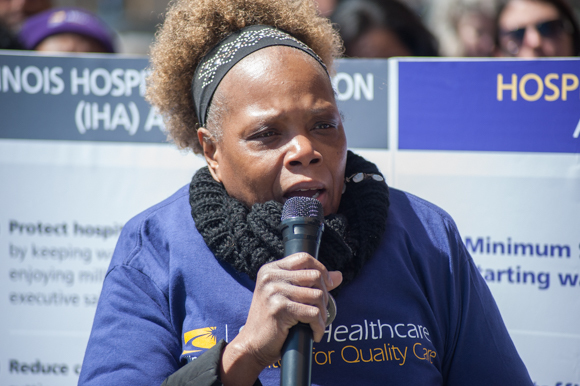 Healthcare Workers From Across the City Say Hospital Lobbying Group Fails to Represent Interests of Safety Net Facilities in Communities of Color, Drives Down Wages, and Ignores the Needs of the Primarily Female-led Workforce. 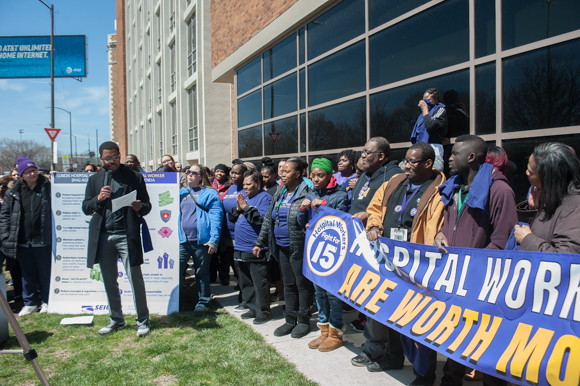 CHICAGO – Over 100 hospital workers and allies from throughout the city called on the Illinois Health & Hospital Association (IHA) to stop paying poverty level wages to its frontline workforce. 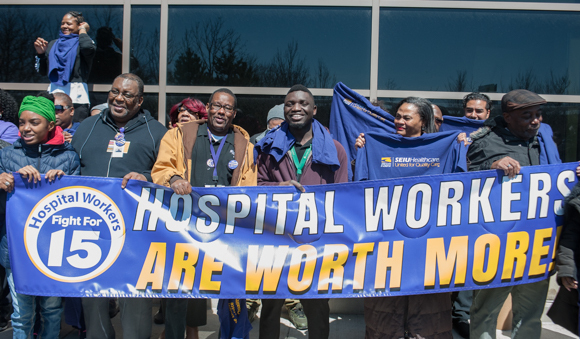 Many hospital workers make just above the minimum wage, despite the fact that these hospitals are pillars and economic drivers in their communities. Women of color occupy a large number of the jobs at hospitals in black and brown neighborhoods, which also exacerbates the level of poverty in households in these communities. One such woman is Isabelle Plair. She’s worked as a transport worker at Ingalls Hospital for 22 years, but only makes a little over $14 an hour. She helps deliver healthcare, but ironically can’t afford the healthcare offered by Ingalls. The out-of-pocket costs are prohibitive. “You can’t go to the doctor because you’ll be in debt,” Isabelle said. Wellington Thomas, an Emergency Tech at Loretto Hospital, told of how workers with SEIU Healthcare teamed up with workers from non-union hospitals to successfully stop the IHA plan to defund safety-net hospitals. Thomas noted that Loretto is the largest employer in the Austin neighborhood and said the next step to ensuring good jobs for Austin is for Loretto to settle a fair contract. “Loretto needs to fight to end poverty in Austin, not be a cause of it. We’re fighting to make Austin a better place and we’re asking Loretto to be a partner to do that,” said Wellington. Greg Kelley, President of SEIU Healthcare Illinois/Indiana, spoke about how the Illinois Hospital Association is the mouthpiece for large, greedy hospitals who don’t pay their fair share in taxes and don’t provide adequate care to poor black and brown communities. “We’re drawing a line in the sand today to say to the IHA that we stopped your plan to take funding away from Loretto and we’ll stand in your way unless and until you make workers and patient care your priority,” said Kelley. “Hospital workers in Chicago will stand against the IHA agenda that cuts corners in patient care and keeps wages for frontline workers low while raising executive salaries,” he added. Cook County Commissioner Deborah Sims and Democratic nominee for Cook County Commissioner District 1 Brandon Johnson spoke in support of workers.